"Life in space is impossible." Mexican filmmaker Alfonso Cuarón (Y Tu Mamá También, Children of Men) has constructed a tense and thrilling 90-minute film about the wonders and horrors of outer space. Gravity is a wildly audacious and ambitious journey about humanity where it shouldn't exist. We are immediately thrown into the impossibilities of the environment before being shown a series of astonishing visuals and mesmerizing scenes of cinematic insensity. Alien famously declared, "In space, no one can hear you scream". Gravity extends this legacy by using advanced filmmaking technology to accurately portray the weightless and vulnerability of living in no atmosphere. We're reminded of Stanley Kubrick's groundbreaking 2001: A Space Odyssey, combining dazzling imagery with timeless storytelling. The film establishes and presents some spectacular physical world building fluidly in a wholly visceral and immersive experience. We're introduced to two stranded astronauts, Dr. Ryan Stone and Matt Kowalsky played by Sandra Bullock and George Clooney, who are the only characters we see. Although her backstory is a little forced, Bullock is perfectly cast, showing a wide range of emotions one after another. Their journey of survival drives the film forward. Clooney charms as a charismatic, heroic version of himself ,countering the terror the characters experience. We are thrown into the action with an opening 13-minute long unbroken take, showing off the beauty and possibilities of deep space. Its majesty and composition are like nothing else. Clooney jumps and floats on a space station, weaving a ballet like environment. The film shifts to an unrelenting and heart-pounding pace with point of view shots throwing us right into the action. Steven Price's musical score is minimal except for moments of sheer terror as Cuarón is unafraid to bask in both the dead silence of space and noisy chaos of what's happening. Cuarón captures space so articulately, through constructive blocking and choreography, by recreating an entirely zero gravity environment cinematically. Cinematographer Emmanuel Lubezki frames the story with a series of seemingly unbroken long takes to establish the reality of space. These uninterrupted scenes create a tense sense of action and momentum without any cuts. It becomes a technically engrossing and wondrous experience. Its breathtaking 3D visuals and landscapes show the breadth and weightlessness to its depth of world building. CGI imagery and special effects are used to propel the narrative forward with a fluid momentum. 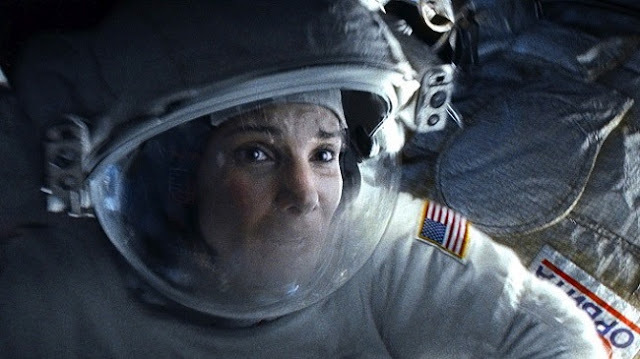 Gravity is a story of survival unfolding almost in real-time set against the harshest and least human of realities as it explores the concept of isolation in space. Cuarón shows us something we've never seen before with painstaking attention to detail and physical accuracy. While not perfect and having some forgettable motivations, the filmmaking is so assured and confident, it drives everything forward superbly. We're shown the complex beauty and potential of space travel before being plummeted into the utter horror of its dark, empty nothingness. It's a dizzying and remarkable achievement of original, narrative, and visual storytelling. "I was stunned, absolutely floored. I think it’s the best space photography ever done, I think it’s the best space film ever done, and it’s the movie I’ve been hungry to see for an awful long time."